CHARLOTTE AMALIE — One of two tropical waves the National Hurricane Center continues to watch has entered the Caribbean Sea as a disorganized system, but forecasters expect the system to develop as it moves west. According to this morning’s NHC update, the fast-moving system will bring showers and thunderstorms to the eastern Caribbean Sea. It brought heavy rains and gusty winds to portions of the Virgin Islands and Puerto Rico and the Lesser Antilles on Sunday. These conditions spread west across the eastern and central Caribbean Sea on Sunday night and are expected to reach Hispaniola today. There were no signs of a closed surface circulation early Sunday, and the center did not provide any information on wind speeds and rainfall amounts expected. Over the next 48 hours, the NHC gives the wave a 40 percent chance of organizing and increasing strength to Tropical Storm Earl today or Tuesday. Through five days, the chance increases to 70 percent. The current forecast track has the system heading over the Yucatan Peninsula and continuing westward to Mexico’s southeastern Gulf Coast. The second wave being monitored, nearly 700 miles west-southwest of the Cabo Verde Islands, continues to show minimal organization. This system should continue moving west at 10 to 15 mph, and development is unlikely due to unfavorable upper-level winds. 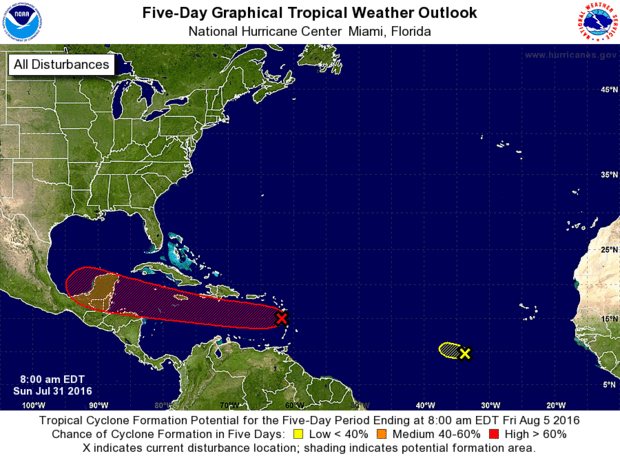 Forecasters officially give it no chance to develop over the next five days. 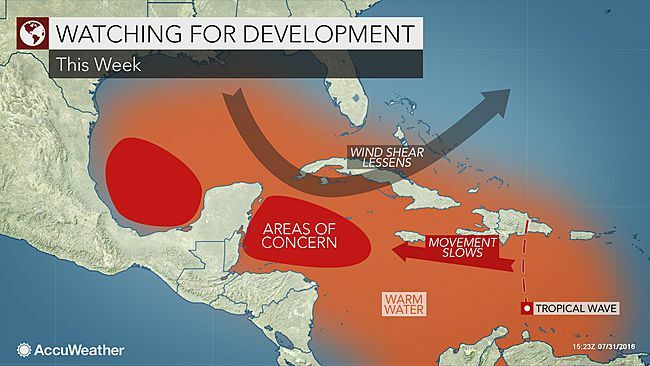 The good news is that the tropical waves tracking through the Caribbean Sea this week raises the potential for rainfall activity in the Atlantic Basin. While the eastern Pacific Ocean has been busy, the Atlantic Basin hasn’t had a tropical storm since Danielle roamed the Bay of Campeche in late June. Dry air is common during June and July over much of the Atlantic. Dry air continues to surround the system at the start of this week. In addition a fast forward motion is also inhibiting the system. “The wave is moving westward at 20-25 mph,” AccuWeather Meteorologist Steve Travis said. Conditions are changing this week. The forward speed should decline over the next couple of days. The overall environment should also become more conducive for the wave to organize into a tropical depression or storm. The system is moving into an area where winds are becoming less disruptive. In addition, water temperatures are near 90 F (32 C) over much of the Caribbean Sea. Details for evacuations, how to pack, and where to look for Hurricane forecasts and updates. The 2016 Atlantic hurricane season began June 1 and ends Nov. 30. Forecasters expect it to be near-normal, with a 70 percent chance of 10 to 16 named storms, including 4 to 8 hurricanes, with 1 to 4 of those being major, Category 3 and above. The 2015 season was below average, with seven tropical storms, four hurricanes, and a tropical depression. Two of the hurricanes, Danny in August and Joaquin in September and October, were major.